Local SEO means optimizing your website to rank higher for your local target audience. Your website provides the opportunity to target the globe. However, if you operate an actual brick-and-mortar location, the overwhelming majority of your customers will come from nearby. Therefore, local SEO is an offsite service that is vital to your business. Local SEO includes making sure your city name, address details and local contact information appear frequently on your website and are prominent in your business listing content. External business listing sites like Google Business pages, Google Maps, Bing, Yelp and Apple Maps are all vital places to ensure you have accurate, up-to-date local contact information for your business. With this many internet users seeking local goods and services, you need to be optimizing your website for local SEO. Find Local Company is your local SEO expert team. We work to leverage several major local SEO directories and resources in order to direct nearby searchers to your company website and location. Google Business listings are a popular place for searchers to locate local companies. 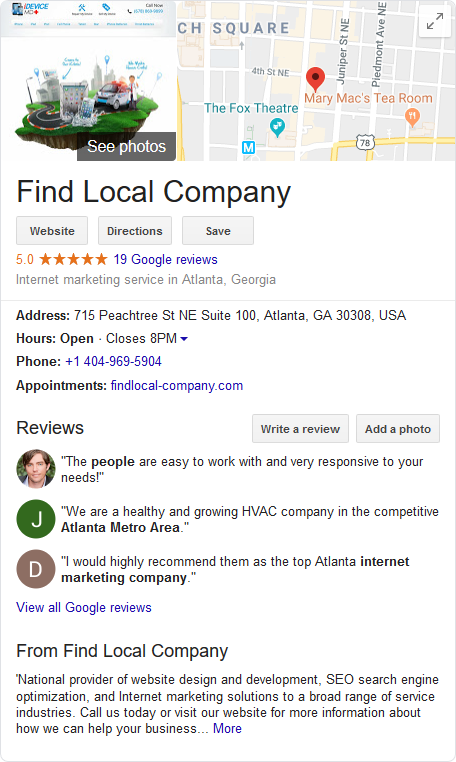 A fully optimized Google Business listing connects to Google Maps and can provide all a consumer needs to locate your business. This includes both your internet location as well as a physical location. The connection with Google Maps even provides directions from the user’s location to your business. Bing is the third largest search engine, after Google and YouTube. Bing Places for Business are well-used business listing pages where you can showcase your company information and products or services. Simply claim your business listing, connect it to your Microsoft account and completely fill out each section with your up-to-date contact information. You can even manage multiple listings under a single dashboard. 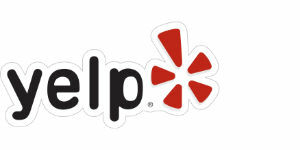 Yelp is a popular site where people search for local companies and products or services based on customer ratings and reviews. It covers a wide range of industries that include beauty and spas, food, health and medical, home services and more. Claim your business listing, verify your company, update your contact information and then post images and begin interacting with customer reviews and ratings. Adding your local business to Apple Maps allows you to be located in active local searches from users’ iPhones. Apple Maps can not only give directions to your location, but is connected to the iPhone’s Siri voice-search tool. When users search with Siri, the location can be pinpointed directly on Apple Maps. Given the popularity of the iPhone, Apple Maps should be near the top of your local SEO strategy. Find Local Company is your team of local SEO experts, and we are top contributors to local search forums on behalf of our clients. Our experienced local SEO team maintains accurate and up-to-date business data and shares relevant business postings for our clients. This is just one more way Find Local Company handles your vital digital marketing chores, freeing you to focus on serving your clients. Do you want to learn more about Find Local Company’s local SEO, offsite SEO, onsite SEO, custom website design or other internet marketing services? Call or contact us online today for more information or to receive a free quote.